In order to do her current job more effectively, U.S. Attorney General Loretta Lynch will stay out of Supreme Court nomination discussion. "As the conversation around the Supreme Court vacancy progressed, the Attorney General determined that the limitations inherent in the nomination process would curtail her effectiveness in her current role. Given the urgent issues before the Department of Justice, she asked not to be considered for the position," Justice Department spokeswoman Melanie Newman said in a statement on Tuesday. 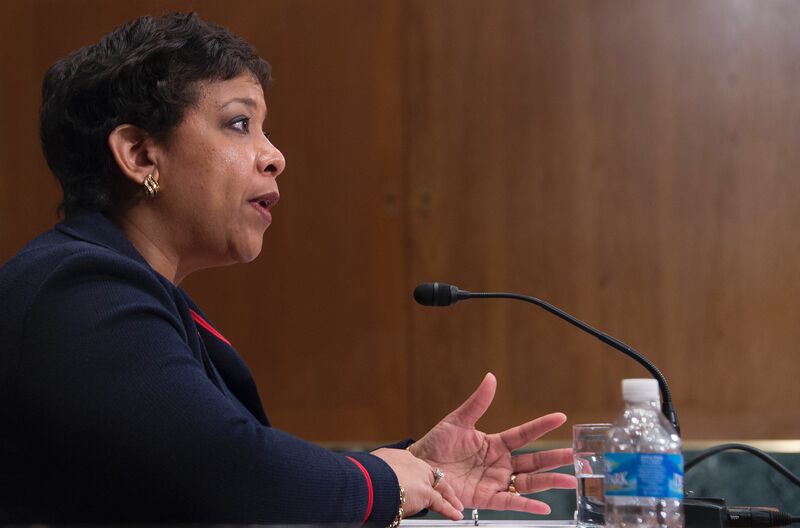 Attorney General Lynch followed up the official statement with some further comments at the Women in the World Salon on Wednesday. “I love this job, and there is so much that I want to push through and cross that goal line until the end of this administration,” she added. Those goals include working to fight human trafficking in the United States, "one of the most invisible yet pernicious crimes." Lynch wasn't considered a lock for the nomination, but her name had frequently come up in debates about whom President Obama might pick as his choice to fill the Supreme Court's vacancy. Pundits theorized that because she had already been recently confirmed by the Senate for her role, it would be harder to deny her in a confirmation hearing. Scotusblog.org publisher Tom Goldstein even reversed an earlier stance to pick Lynch as the most likely nominee. However, Lynch seems dedicated to following through in her current job. Most recently, she undertook a federal lawsuit against the city of Ferguson, Missouri for unjust policing which violated the First, Fourth, and 14th Amendments. Now that Lynch is no longer in the running, The Washington Post identified five candidates whom the White House is considering for the nomination: Sri Srinivasan, Patricia A. Millett, Jane L. Kelly, Paul J. Watford, and Ketanji Brown Jackson. All of them are currently sitting federal judges, and each has certain representative merits. Srinivasan would be the first Asian American to serve on the Court, Millet and Kelly would increase the number of women, and Watford and Jackson would add another African American to the bench. President Obama's working theory seems to be that these five judges are moderate enough to appease grumbling Senate Republicans, but progressive enough to shift the dynamic of the court substantially. That's no guarantee that the GOP will comply — many prominent party leaders, including presidential candidate Marco Rubio and Senate majority leader Mitch McConnell have publicly stated that they will block Obama's nomination no matter what. Lynch could have been a great Supreme Court justice, but her bowing out of contention doesn't seem to have swayed President Obama from his goal of seeing a new justice installed before the end of his term in the White House. Senate Minority Leader Harry Reid suggested last Wednesday that the nominee is forthcoming, so the next phase of the appointment process could be just around the corner.